For a quality 5.56 firearm from IWI, look no farther than this version of the ever popular Tavor. With only upgrades coming through from the original SAR, the 5-6 lb. trigger pull, ambi mag release, and a forearm with Picatinny rails at the 3, 6, and 9 o'clock positions, you will feel the power of this super popular firearm as soon as you hold it in your hands. 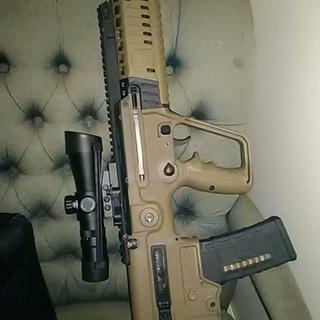 I love this Tavor even more then my AR. Its a great close quarters weapon and is extremely accurate. The majority of the weight is at the back of the weapon and that makes it easier to hold and fire with less time spent on target reacquisition. I recommend this weapon highly. Its a quality weapon and well worth the price. With a red/green dot scope its unmatched in my opinion.